There are a number of fun math problems for high school on the mathjokes.net website. We'll help you cover all sorts of math concepts like fractions, algebra, geometry, number skills and more. But also, importantly, you'll learn additional general math skills like logic, puzzles and spatial skills. This is fun math problems about fraction for you to try. 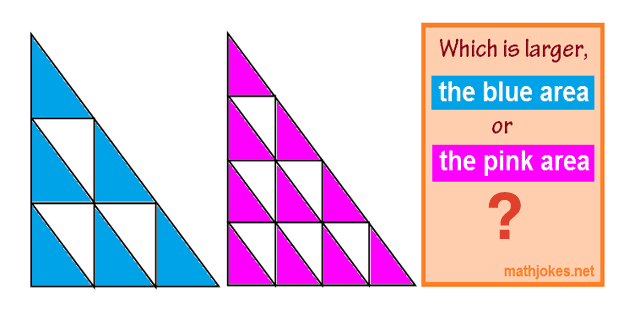 The large triangles are identical. Which is larger, the pink area on the left or the blue area on the right? All internal triangles are similar to the larger triangles. 0 Response to "Fun Math Problems for High School"